Argyle High School had 9 students commit to various colleges and universities on National Signing Day. 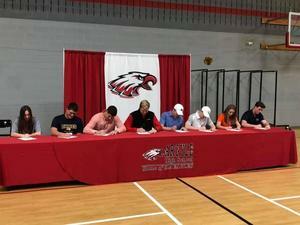 Pictured from left to right: Rebecca Sutton (volleyball), Brandon Lancaster (football), Preston Wilson (football), Connor Homeyer (football), John Crowder (football), Blake Ramsey (football), Mabry Ward (volleyball), and Chad Ricker (baseball). Congratulations to all of these student-athletes.